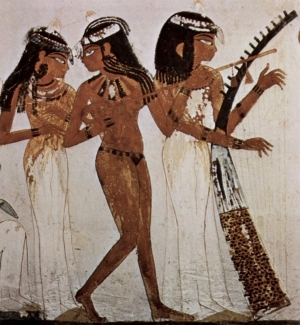 Nan had an Egyptian style plastic vase with dancers like these on it. Last week I was nearly overwhelmed with an irrational need to cry and cuddle a man with a large single fake breast under a pink satiny nightdress. To place my head where the other breast would be and where I’d be safe. I managed to resist luckily but it was disconcerting and took me a few moments to work out why. The man was of course Stanley Bad (my arch nemesis) but that is somewhat irrelevant. The reason I wanted to cuddle him was because the dress with that single breast reminded me, at some deep non-conscious level, of my Nanny Queen. It always surprises me when I remember Nanny Queen (Queenie Fisher was her real name). She died when I was about six and I don’t really remember her as a person, I remember her as moments. She had one breast removed due to breast cancer and a foam breast to replace it. Sometimes when she was indoors the foam breast would become uncomfortable and she’d take it off. I have a picture of it in my head now, biege coloured, a bit like someone had torn off a lump of sofa foam and stuck a nylon flesh coloured pop sock around it. I don’t remember her being there but I remember me and my brother playing with this foam breast. I remember she used to make delicious moose deserts in fancy wine-like glasses but only when we deserved something special. I remember her slapping my brother, he was climbing the shelves where she kept all her china and glasses. She must have been terrified he’d hurt himself, but I was just shocked that she was angry. Her and mum used to go to the fresh fish market together and come back with lots of stinking fish that they’d behead and bone in the kitchen. This fascinated me. I’d sit at the large pine kitchen table and Nan would give me a plate with bits of fish on it for me pick out the bones, so I felt just like a grown up. These memories are very vivid but picturing her face is difficult. In my head I can see a picture from a photograph of her in which she has a big smile and looks well, and then I remember her face in the hospital under the breathing apparatus when she was nolonger my Nan and I realized the poem I’d drawn for her about sunflowers, which I was so proud of, was never going to be seen. And I remember the plastic egyptian style vase she used to have in the bathroom with dancing figures painted around the middle. If I turned the vase in my hand the picture of the figures would go on and on and on forever. It was magic.